Stocks are off to a good start this morning, as all major indices are pointing higher. However, this is what some traders would call a “dull market”. This is actually great for us. Because when the general market gets boring, more traders start to jump into stocks that are moving– penny stocks. 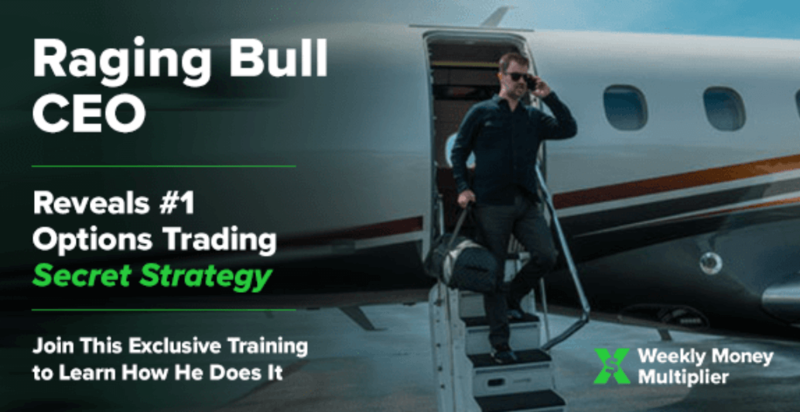 My focus is on finding actionable trading ideas for my clients and teaching them how to trade proven strategies. 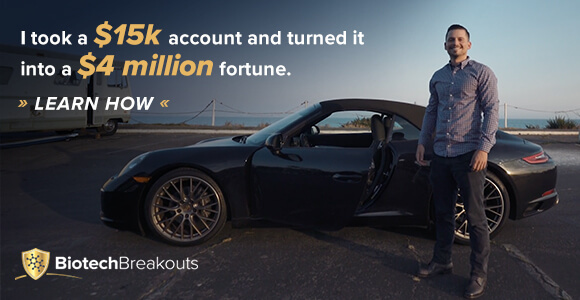 After banking over a quarter million in trading profits this year, and now I’m dedicating the rest of the year to teaching my clients to become better traders. That said, it’s time for my latest catalyst swing trade alert. Now, the goal for these trade ideas is to return 20% or better, the hold period varies, but it could be a couple weeks or more. As you know, many of these catalyst swing trade alerts have been producing monster winners…and I like to share as much as possible with you. But the reality is, my clients receive about ten of these alerts per month… if you’d like to receive my alerts in real-time through text or email, then click here. My latest alert is a Chinese stock… however, it’s probably not the one you’re thinking of. Read on for the full details on the UXIN trade. When insiders and institutions are fighting for shares of a company on every price drop, I guess it’s worth our attention as well! In other words, we’re seeing traders and investors buy nearly every time the stock drops. With this trade idea, I’m especially enthusiastic as we identified a multiple of potential positive catalysts. Before we get into the details of the catalysts and play in Uxin Ltd (UXIN), let’s look at the company profile. UXIN is an investment holding company. The company, along with its subsidiaries, operates used car e-commerce platforms through its mobile applications and websites in China. Now, UXIN primarily facilitates used car transaction services and financing solutions offered by third-party financing partners to buyers for their used car purchases. UXIN has two applications: “2C business”, an application that provides consumers with customized car recommendation, financing, title transfer, delivery, insurance referral, warranty and other related services; and Uxin Auction, its so-called “2B business,” an application that helps business buyers to source vehicles through online auctions. Late last year, UXIN noted there is growth potential in the “2C business” and decided to allocate their resources to this activity. Especially the number of used vehicles transactions from richer regions to poorer is increasing rapidly. 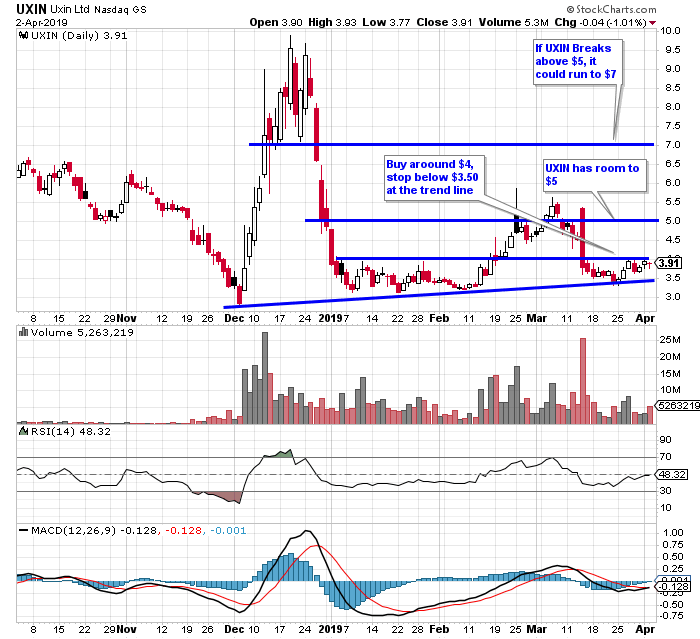 UXIN has been a volatile stock over the last few months. However, as traders, volatility allows us to make money. With UXIN, the volatility is interesting because we think that if any positive catalyst will fire, a large move can happen easily very soon. As always, we focus on patterns, value, and catalysts. That means we look at both chart patterns and potential catalysts… and we find an area of value to buy. That said, let’s take a look at some potential catalysts in UXIN, followed by the play. If you don’t know already, we’ve traded this stock before… and done well. Now, there are multiple potential positive catalysts in UXIN… and with the way the stock has been trading, any one of these can hit the newswire… and UXIN could run up. Now, UXIN is expected to report earnings on June 13, 2019. Keep in mind, companies can change their earnings date if they choose to. The revenues in Chinese yuan (RMB) of the last 3 quarters are; Q2 665K, Q3 863K, Q4 1.136K. The company’s last estimate for Q1 was 950K or 16% lower than the previous quarter. However, we think this earnings estimate is too modest, even when considering the potential negative effect of the first season of the year. UXIN has $116M in cash with a burn rate of $45M per quarter. That said, the company’s cash on hand would allow them to run through at least until 2020. Based on this cash position and the fact that the stock price is currently trading at lows, we are not worried about any secondary offering. If you don’t already know, secondary offerings could cause stocks to drop because the company is diluting shares. Now, we’ll be looking for news in the coming days related to their higher than estimated revenues. China recently lowered its subsidies for electric cars which is positive news for the used cars market. We will look for more news of this kind like “lower number of new cars sold in China”. You see, if less new cars are being sold in China… where do you think that market share goes to? Of course, it goes to the used car market… which benefits UXIN. Over the past few months, a lot of options were traded with a short time to expiration. For example, on February 15, a large number of options were bought with just one month until the expiration date. Now, the purchases in short-dated options indicate someone is expecting something to happen very soon… UXIN’s price went up 25% between February 15 and March 15. A good guess of that trader or did he knew something? “Calls at the Ask”, indicates that someone is buying calls while “Puts at the bid”, indicates someone is selling puts. Both option transactions are done by someone that thinks the price is going to go up very shortly! Since the beginning of this year, a number of institutions took passive stakes in UXIN which indicates that price is getting at an interesting level with enough liquidity. The increased institutional interest made Credit Suisse initiated the company with an outperform rating and placed a price target of $7.7 for the first time. That said, Credit Suisse sees more than 90% in upside compared to the current price level! We will be looking for more price targets to be published shortly by investment banks. Since 2018, UXIN started a partnership with Taobao, China’s massive and fast-growing consumer community, operated by Alibaba Group. Now, this partnership could become a game changer for UXIN as you can easily place the Alibaba Group (the Chinese multinational conglomerate specializing in e-commerce, retail, Internet and technology) on a line with Amazon or Google. We will be looking for more positive news on this integration and potential positive impact. Check out the daily chart in UXIN. We’re looking to buy around $4 and use the trend line support to set $3.50 as our lowest stop loss. If the stock finds momentum or a catalyst fires, the price could rapidly reach the $5 mark and shoot past it towards even $7! The large options volume transactions, institutions wanting to have a piece of UXIN, the recent partnership with BABA and the $7.7 price target make us believe this stock will go up before its earnings. Even, if you are a firm believer that the revenue will be higher than what they modestly estimated, you could consider holding a small position through earnings, although that’s always a risky bet! Anyways, I’d like to hear what your thoughts are on this play… hit me up on Facebook or Twitter. I look forward to hearing from you.